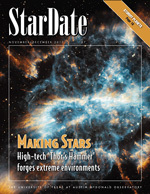 Subscribe to StarDate: Print or digital subscriptions start at just $26! Just $26 a year! Our popular bimonthly astronomy magazine is the perfect skywatching companion for anyone interested in astronomical events and space exploration.